This beautiful Sundial condominium is very cozy. 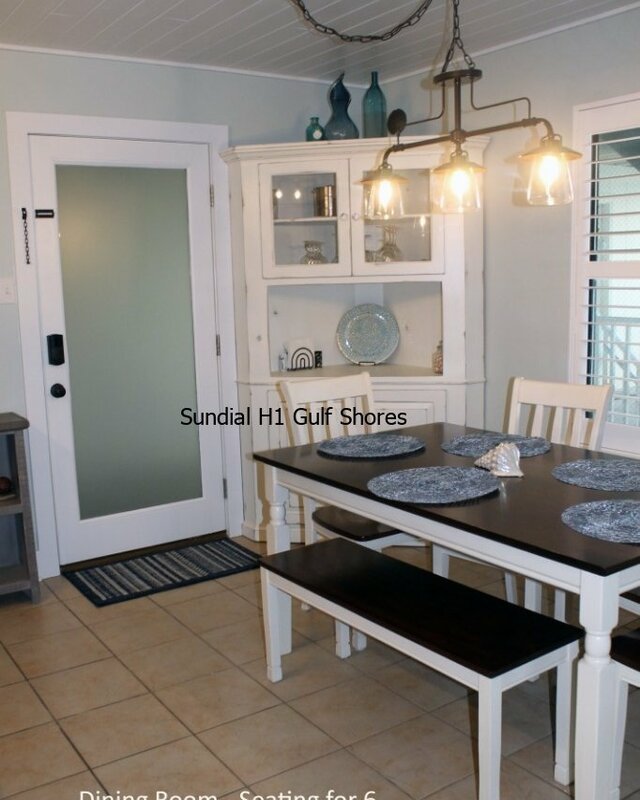 The coastal farmhouse decor is brand new and comfortable giving you the feeling that you are in your own home. 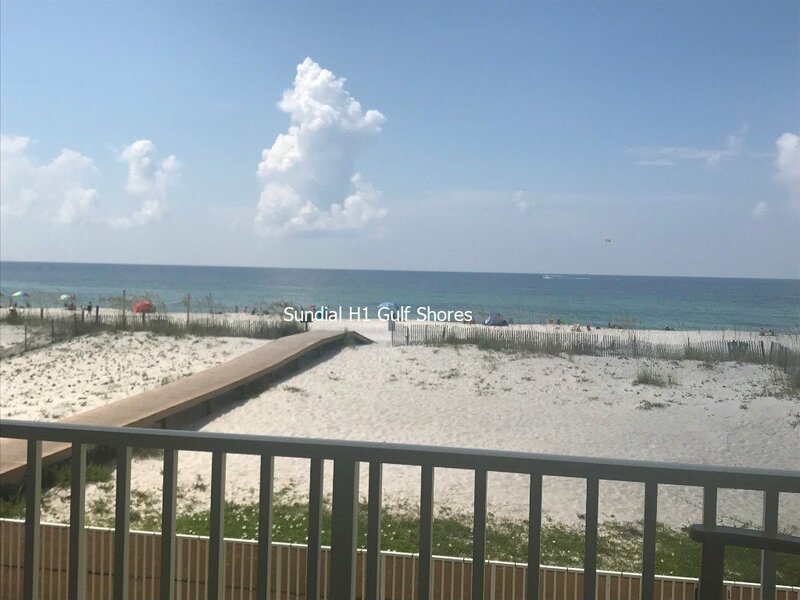 There is a 50 inch flat screen TV in the living room and flat screen TVs in all of the bedrooms.The kitchen is fully equipped and boasts new quartz countertops and stainless steel appliances. The entire building just received a facelift in 2019. You will enjoy your time in this peaceful condo as there are only 24 units in the building so it is nice and quiet. 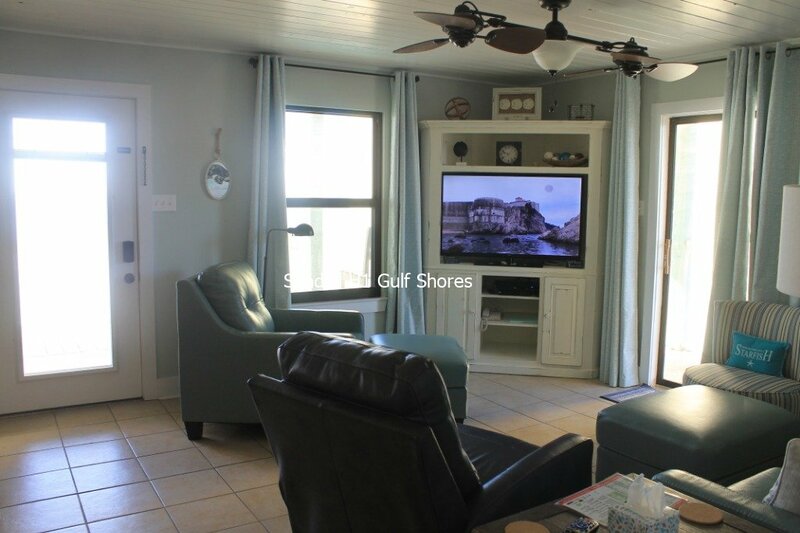 The west side wrap around balcony is very spacious giving you a place to watch the surf and the dolphins play and a place to keep your beach chairs and other items. The location is ideal because it is just a mile and half from Hwy 59! 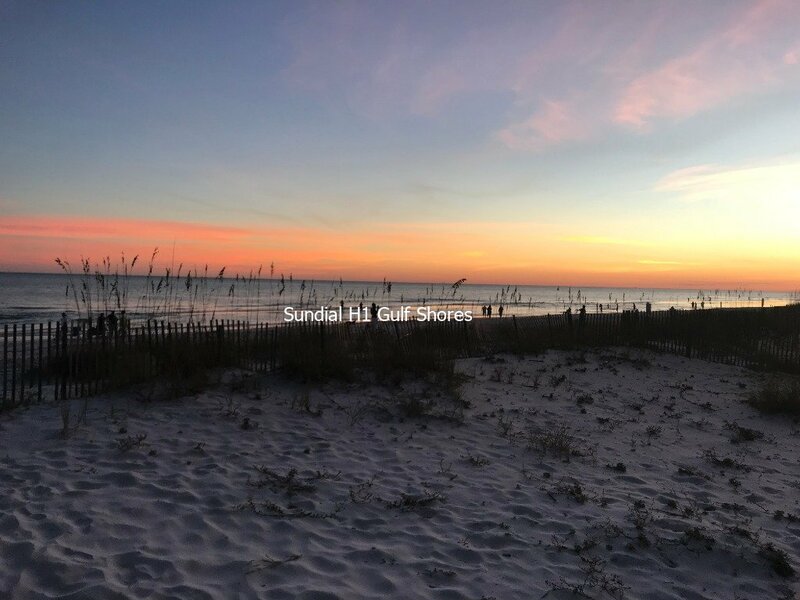 Across the street you have the convenience of Waves, S & S Seafood, Island Ice Cream and The Gulf House Restaurant. See https://sundialh1.com/ for more photos! Address: 1149 West Beach Blvd. Convenience store across street with liquor store, seafood market, ice cream shop and restaurant in shopping center. Totally renovated with new kitchen and bathroom cabinets, quartz countertops, stone and tile walk in shower. Very comfortable and cozy condo. Kitchen has everything you need! Building siding updated 2019! No pets. No smoking in unit. Must be 27 and above to rent. As the owner, I prefer to talk to you by phone before booking your reservation, so please leave a contact number. You will be asked to send a deposit of 50% via PayPal before booking confirmed. The remaining balance is due no later than 45 days prior to the date of your reservation. All payments are processed through PayPal. You do not need a PayPal account to pay online. Just select to pay without a PayPal account. Additional 13% is added per law for Alabama lodging taxes. A required $150 cleaning fee is also added. Must send 50% deposit via PayPal before unit is reserved. Checks are okay. The remaining balance is due no later than 30 days prior to the date of your reservation. All payments are processed through PayPal. You do not need a PayPal account to pay online. Just select to pay without a PayPal account. Frank and Annette Stelly are from Crowley, Louisiana. (Cajun Country) We purchased unit in March of 2018. We are the Parents of three and grandparents to four. Frank is in the oilfield and Annette is a high school counselor. We have been married for 37 years. Please call Annette if you have any questions! 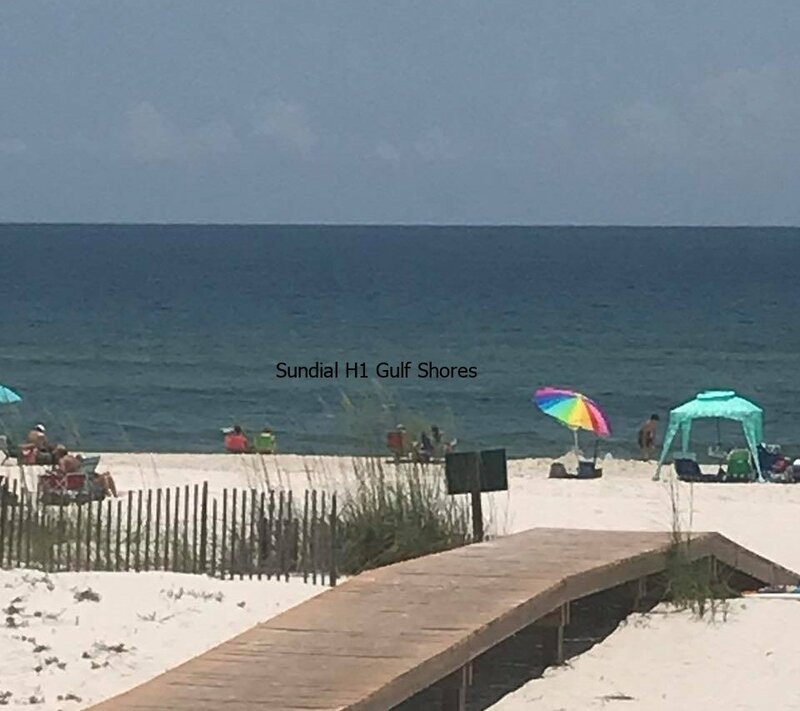 (337) 581-0421 On the web visit https://sundialh1.com/ to see more photos of the property, condo and more! Love this condo and area! We loved staying in this complex and in this unit! Everything is updated in H1 and was so comfortable! 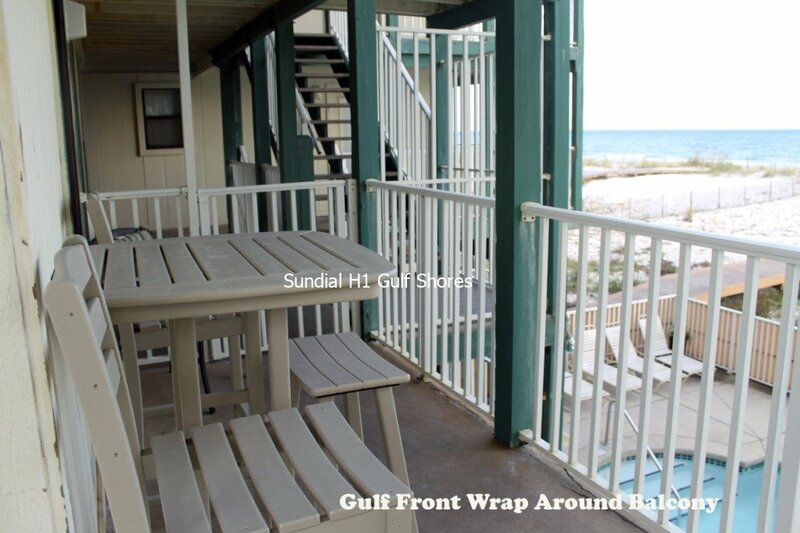 We loved the balcony and how we had a place to keep all of the chairs without going through the condo! The boardwalk with the beach so close is very convenient. You don’t have to walk far at all to get to the beach. Plus the small store, restaurant, ice cream shop and seafood market across the street is so convenient. We also like how the complex is small and beach isn’t crowded. This condo is very cozy and beautifully remodeled. Just a few feet away from the beautiful beach. It is also right in the center of everything you need from shopping to restaurants. Highly recommend this place and will be revisiting soon! I stayed here for a girl’s week long trip, and it was perfect! The beach is literally a dock away, and it was not overly crowded like some of the high rise condos nearby! It was the perfect getaway! Will definitely be going back! I actually stayed here twice this summer. I loved it so much the first time with my friends, I came back to this unit with my co-workers. It feels so warm and cozy—definitely a home away from home. The unit is updated and beautifully decorated with all the amenities you need. 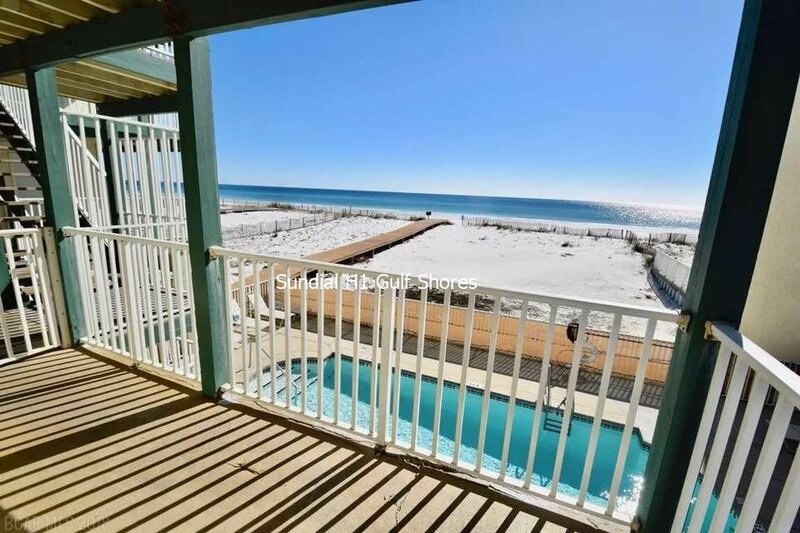 And the pier is steps away from the unit with the beach so close. Love the fact that the beach is not overcrowded as it is sometimes with the high rise condos. Definitely going to plan my next beach stay here again. I stayed heee this passed summer for a girls trip. Wish I could have stayed longer. The condo is beautifully decorated. Love Ms. Stelly style. Great view of the beach. Only steps away. Was not crowded like other condos. Close to everything. Grocery store, restaurant and ice cream palor across the street. Ice cream is refreshing after a day on the beach. Will definitely be back.